Google's threat to pull out of China over what it claims to be cyber attacks has left millions of Chinese users concerned - and analysts described the move as the company's strategy to put pressure on the Chinese government. Google - the world's largest search engine - said in a statement yesterday that it is considering exiting China after the company had been hit in December with major cyber attacks that it believes originated in the country. It is not clear whether users in China, including many foreigners, would continue to access services such as Gmail and Google Map, should the company shut its service. David Drummond, Google's chief legal officer, said in an unusual statement posted online that the company had detected a highly sophisticated and targeted attack from China that resulted in the theft of the company's intellectual property. "These attacks ... led us to conclude that we review the feasibility of our business operations in China." He said Google will no longer continue censoring results on Google.cn, a Chinese-language website it launched in 2006, and is discussing with the Chinese government the possibility that it operate an unfiltered search engine within the law. "We recognize that this may well mean having to shut down Google.cn, and potentially our offices in China," he added. The statement marks a shift in the company's China strategy for the past five years, which is to provide censored results under Chinese law through its domestic search engine in exchange for a presence in the world's largest online population. That strategy helped Google take about 35 percent of China's search engine market in the fourth quarter of last year, according to domestic research firm Analysys International. Jiao Jian, an office worker who uses both Baidu and Google every day, said the possible shutdown of the Google search engine will have little impact on his life as many other firms provide similar services. "But it's hard to find alternatives to Google's other services, such as Google Map, Google Earth and Gmail," he said. He also expressed concerns over the availability and safety of his Gmail account if Google exited the country. Google started a Chinese-language search service as early as 2000 but the company did not have a significant presence in the country until it established a China team in 2005 and launched Google.cn the following year. Google's possible retreat from China has prompted the company's 700 China staff to fear for their jobs. "At a general meeting on Wednesday, we were told that Google might quit China, and all of us feel very sad," said an employee with Google's Beijing office on condition of anonymity. Drummond's post also said Google would try to negotiate with the Chinese government for more favorable operating conditions in China. However, the anonymous employee told Xinhua that most Google employees are pessimistic about the outcome of the negotiations. "No agreement will be reached with both sides refusing to give in," he said. But Guo Ke, a professor on mass communication at Shanghai International Studies University, said it was "almost impossible" for Google to quit China but the Chinese government would not put an end to censorship either. "It will not make any difference to the government if Google quits China; however, Google will suffer a huge economic loss by leaving the Chinese market," Guo said. "Chinese Internet users are the real victims if Google quits China. 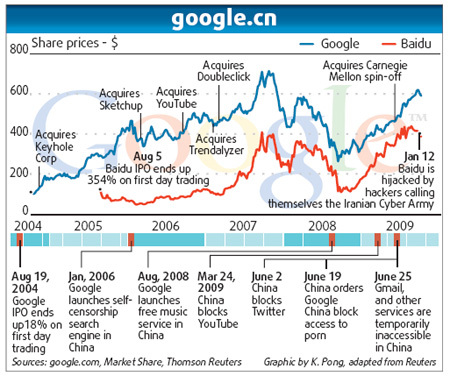 I think Google is just playing cat and mouse, and trying to use netizens' anger or disappointment as leverage," Guo said. An unnamed official from the State Council Information Office said yesterday that the government is seeking more information on Google's statement. The official, cited by Xinhua, said it is hard to say whether Google will quit China. Ever since Lee Kaifu quit as head of Google's China operations six months ago, there have been rumors that the company was rethinking its China strategy and even move its servers out of the country after being involved in a series of government-led Internet crackdowns last year. It was reported that many employees left Google after Lee's resignation in September and the company has not recruited any new staff since October, according to a Google employee who declined to be named. Dozens of Google users gathered at the company's headquarters in Beijing yesterday afternoon, some bringing flowers to say farewell. Most of them were university students who came to pay tribute to the IT giant, expressing disappointment at its withdrawal from China. Google is one of the few Internet giants that have a significant presence in China. Other firms such as Yahoo! and eBay Inc have given up on the China market after years of sluggish performance. Millions of Chinese are fans and loyal users of Google and its services such as Gmail, Gtalk and Picasa. If Google quits China, all its users may have to move their emails and other documents and pictures in advance. According to the latest official figures, China had 338 million Internet users by the end of June last year. Google's major competitor Baidu had a 58-percent market share in the last quarter, according to Analysys International. When I was working in Manhattan as a management consultant (this was years before "bailout" and "financial crisis" entered into quotidian small talk), swanky restaurants and elaborate dinners were part of the regular "team-building" and "client meeting" routines. Actor Zac Efron arrives at the 15th Annual Critics' Choice Movie Awards in L.A. Cast members promote HBO's "The Ricky Gervais Show" at the HBO sessions of the Television Critics Association winter press tour in Pasadena, California January 14, 2010. China will invite high-ranking officials from UK and France to attend a ceremony of the 150th anniversary of the Yuan Ming Yuan Park’s demolishing disaster.